The North Star Ambulatory Assessment (NSAA) is a 17-item rating scale that is used to measure functional motor abilities in ambulant children with Duchenne Muscular Dystrophy (DMD). It is usually used to monitor the progression of the disease and treatment effects. The test must be completed without the use of any thoracic brace or leg orthoses. Therapist asks the patient to complete activities listed in the table below. This scale is ordinal with 34 as the maximum score indicating fully-independent function. as still as you can? Best done on the floor rather than on a mat. count of 3 seconds to score 2.
floor/supported on a box step. throughout the activity to score 2.
leg for as long as you can? Stands on top of the box step facing forwards. box using your left leg first? chair has to be used. Starting position standing on floor on right leg. No shoes should be worn. consistent as to whether shoes are worn or not. a double support phase), but more than a walk. 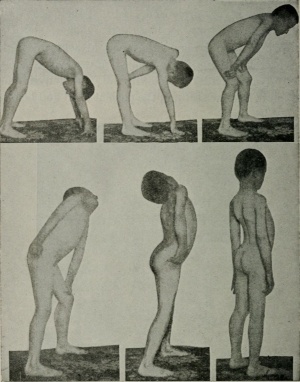 Rising from floor manouver that may be presented by DMD patients. Several studies have shown that NSAA is a quick, specific, reliable, valid, and clinically relevant method to measure the functional motor ability of ambulant children with DMD. NSAA is also considered to be suitable to be used in research and in a multicentric setting provided that adequate training is given. A psychometric assessment of NSAA showed that NSAA has 0.91 Person Separation Index (i.e. a reliability statistic). A multicentric study showed that NSAA has a high intra-observer reliability of 0.95. It has a low inter-observer reliability ( < 0.5) when assessed after only one training but the reliability increased to 0.995 after the second training. It means that NSAA is reliable in a multicentric setting provided that adequate training is given. Another study showed that NSAA has a high test-retest ability. It also has a high inter-rater reliability with 0.95 consistency and more than 0.93 absolute agreement. A psychometric assessment of NSAA showed that NSAA is valid with a good targeting (i.e. very few items measure the same level of ability) which equates to a better interpretation of results, This study also showed that NSAA has little misfit; which means that there was only a few items where the participants performed differently from the prediction. In fact, there was only one item (i.e. "lifting head from supine") where the participants performed significantly differently from the prediction. A psychometric assessment of NSAA showed that the hierarchy of items within NSAA was supported by clinical expert opinion, thus increasing its clinical interpretability. The items in NSAA scale are listed based on their level of difficulty which is mostly agreed by experts (ρ = 0.80). A questionnaire-based study showed that clinicians considered NSAA as clinically relevant. A revised version of NSAA was developed with items ordered according to the participants' age when they could be reliably performed. This version showed that NSAA can be used in patients starting from the age of three years. ↑ 2.0 2.1 2.2 2.3 2.4 Mercuri E, Mayhew A, Muntoni F, Messina S, Straub V, Van Ommen GJ, et al. On behalf of the TREAT-NMD Neuromuscular Network. Towards harmonisation of outcome measures for DMD and SMA within TREAT-NMD; Report of three expert workshops: TREAT-NMD/ENMC workshop on outcome measures, 12th–13th May 2007, Naarden, The Netherlands; TREAT-NMD workshop on outcome measures in experimental trials for DMD, 30th June–1st July 2007, Naarden, The Netherlands; Conjoint Institute of Myology TREAT-NMD Meeting on physical activity monitoring in neuromuscular disorders, 11th July 2007, Paris, France. Neuromuscul Disord 2008;18:894–903. ↑ 4.0 4.1 4.2 Mazzone ES, Messina S, Vasco G, et al. Reliability of the North Star Ambulatory Assessment in a multicentric setting. Neuromuscul Disord 2009; 19: 458–61.